I'm not sure Christina Dodd has ever had a secondary character who resonated as deeply with readers as Gabriel Prescott. After teasing us with glimpses of Gabriel throughout the books of not one but two series (Lost Hearts and Fortune Hunters), Dodd finally took pity on the mass of begging fans (of which I was one) and gave us Gabriel's story, Danger in a Red Dress. It did not disappoint! 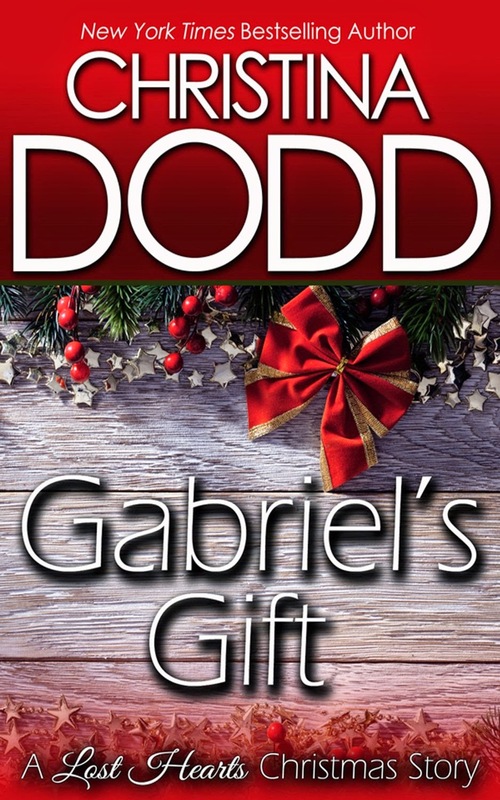 It's been five years since Gabriel's happy ever after so you can imagine how excited I was to hear that Ms. Dodd was giving us an opportunity to catch up with our intriguing hero in her Christmas epilogue, Gabriel's Gift. It's a tiny bite of delicious delight just perfect for the busy holiday season and wraps up Gabriel's happy ending with a big, red, heartwarming bow! When a wealthy, elderly gentleman dies in nurse, Hannah Grey’s care and leaves her a $50,000 bequest, his selfish and vindictive children convince a judge that Hannah slept with their father to obtain the money, causing Hannah’s nursing license to be revoked. Now jobless and increasingly desperate, Hannah accepts an offer from handsome, charismatic Carrick Manly to care for his ailing, difficult mother at their home in another state but it doesn’t take long after her arrival in Maine to realize she has jumped from the frying pan into the fire. Carrick’s charm and apparent concern for his mother hide a devious and manipulative core, Mrs. Manly has a secret that could put her life in jeopardy and Hannah finds herself caught squarely in the middle. Abandoned as a child, then separated from his foster siblings, Gabriel Prescott has spent a lifetime searching for his family. After recently discovering that he’s the biological son of the infamous Nathan Manly, a businessman who abandoned his company and family, disappearing with billions of dollars, Gabriel is making plans to break the news to Carrick Manly that they are half-brothers. Before he can however, Carrick contacts Gabriel with the news that he has reason to be suspicious of his mother’s new nurse and hires Gabriel’s security company to monitor his mother’s home and gain evidence against Hannah. Wanting to do all he can to help his younger brother, Gabriel takes him at his word and, believing the worst of Hannah, he moves into the Manly home to begin surveillance, but he never expected Hannah to be so lovely or seem so sincere, so innocent. Using an alias, Gabriel works with Hannah to provide security for the Manly Halloween party, falling more deeply under her spell with each encounter, but just as he convinces himself that Carrick must have been mistaken about her, events take an unexpected turn and the fragile trust that had begun between them is shattered, sending Hannah running for her life. Gabriel and Hannah are both searching for a place to belong but abandonment and betrayal have taught them to be wary of placing their trust in others. Dodd puts them on a collision course where only by trusting in one another will they be able to survive but circumstances present Gabriel with a heartbreaking choice. And when Hannah discovers Gabriel’s true identity will she be able to forgive his lies or will they send her running from him and straight into danger? Dodd captured my attention from the first line, Hannah Grey couldn’t remember when she’d enjoyed a funeral more, and held it to the final page of this intensely passionate, suspenseful, action-filled story. From beginning to end, Danger in a Red Dress is pitch perfect and an intensely satisfying conclusion for the man who captured readers’ hearts all those years ago. Readers, do you enjoy epilogues? Do you want them to focus solely on the hero/heroine of the book or include other characters from the series? What secondary character's book are you still waiting to read? For what book would you most like to read an epilogue...or second epilogue? I'll brighten the holidays of one randomly chosen person who leaves a comment today with a copy of Danger in a Red Dress (winner's choice of kindle copy or print) and a kindle copy of Gabriel's Gift. New York Times bestselling author Christina Dodd first introduced you to Gabriel Prescott in her beloved Lost Hearts series. She continued his story throughout the suspenseful Fortune Hunters series and at last, in DANGER IN A RED DRESS, readers rejoiced as he at last discovered the truth about his family, and met the woman of his dreams. Now, in this original short story, Gabriel must confront the demons of his past for a young girl to have any hope of a future, and discovers that, at Christmas, blessings sometimes come in disguise. Enjoy GABRIEL'S GIFT: A Lost Hearts Christmas Story, a heartwarming epilogue for readers of Christina Dodd's Lost Hearts and Fortune Hunters series. 10,500 words, first publication 2014. I'm sorry you aren't able to get more of her books through Audible UK, Q. I know several are available in audible here in the US. I'll ask her if there are plans to expand the selection in the UK. Love your books Christina. This sounds true to form. Can't wait to read. 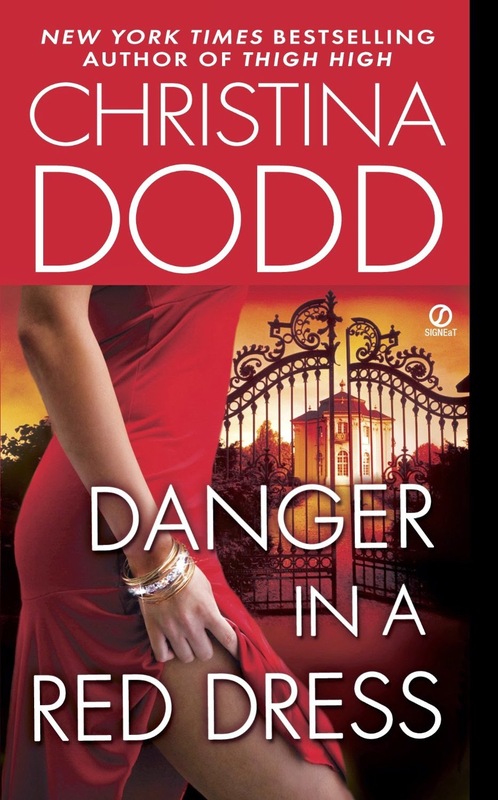 It's a terrific romantic suspense, Vickie and while it's tied to the books in the two series, Danger in a Red Dress stands well on its own. And I loved Dodd's governess series!! SO HILARIOUS and perfect. Hellie, like you, I adore the humor in Dodd's books! I'm a long-time Christina Dodd fan. My favorite Dodd books are historicals. However, I loved the Lost Hearts books so much that I own them in print and digital versions, and the Fortune Hunters quartet is one of a very few romantic suspense series on my keeper shelves. Gabriel's Gift is on my Kindle, and I have promised myself time to read it very soon. I got so caught up in my enthusiasm for La Dodd that I forgot to say that I love epilogues and second epilogues. Like many other readers, the secondary characters whose story I am most eagerly awaiting is Lyon Redmond and Olivia Eversea's story from Julie Anne Long. I'd love a second epilogue to Connie Brockway's My Dearest Enemy to know more about Bernard and about Francesca. I remember reading Christina's Lost Hearts series. Gabriel was memorable, indeed. I haven't read the current story yet, but I do enjoy those "visits with old friends" that we get in epilogues. I particularly enjoyed Julia Quinn's Bridgerton series second epilogues. Live epilogues. I like to know how their lives turn out after the happily ever after. Live Christine Dodd's books. Me too, Kathleen. I especially like the ones that show us how happy they still are many years down the road. I want all the extras that the author wants to give me so yes to epilogues and prologues. Me too, catslady. I never tire of reading about favorite characters. Yes, I love epilogues. I like to know they get their happy ending and live happily ever after. I'm always a little disappointed is there isn't one. I do love epilogues and if they are for a series, I like visiting with other characters - as long as it doesn't seem forced. :-) And yes ma'am, my Kindle is filled with tons of shorts for the busy Christmas season! That's one of the things I liked about Gabriel's Gift, Glenda. The family is gathering for Christmas which was very natural. Christina Dodd writes great books. She has great skill at drawing a reader in and having them be wrapped up in story. As long as something is well written it doesn't have to be a series. I do enjoy a continuation of characters in a series. Wow, I've read all of the Fortune Hunter series and Lost Texas Heart series. I loved them! And in Danger in a Red Dress I got so interested in Gabriel and now there's his book, his novel <3 A romances with a dash of suspense and a lot of humor. Got to love Christina! After reading the books in both series, I was so afraid we wouldn't get Gabriel's story but then there he was in Danger in a Red Dress. I loved it! It is so hard to keep up with prolific writers, and Dodd is one of them. I didn't make it through either of those series. I think I had better dig through my TBR Mountain to wee which of them I have and get busy reading. There have been a few secondary characters I wanted stories for, but in most cases the author has taken care of it and written their story. Most recently, Elizabeth Hoyt's Darling Beast giving me the story for the character I wanted. There are many books I would like to be able to check in on the characters to see how they were doing. Lengthly series sort of take care of that for me. It is also why I enjoy series set in small towns. Anthologies are a favorite of mine. I have a bookcase full of them and have many on my Kindle. I keep one handy in the car. My life often gets chaotic, so the novellas are the perfect length for an enjoyable read when I don't have the time to start a regular book or something like Outlander. I know I will read and get nothing done. Novellas save me from myself. I hope you had a wonderful Thanksgiving and have a bread Holiday Season.